Exclusive Beach Colony is located on 11 acres of fabulous beachfront. The ingenious angular living room design transforms every residence into a Corner unit. Wall-to-wall sliding doors and adjoining windows actually wrap around the living room, filling it with light, and revealing the panoramic beauty of the Gulf. The sweeping 300 SF terrace will be a favorite spot for quiet moments and lively gatherings alike. The uniquely situated Master Bath is a world unto itself. The whirlpool bath is surrounded by large, wrap-around windows to offer a view of the hypnotic Gulf. 1750 SF with Tile throughout Living, Dining, Kitchen and Carpet in Bedrooms. Electronics include 50" TV, VCR/DVD in Living Room and 42" TV in Master Bedroom, 23" TV/DVD in Guest Bedroom, 42" TV in Guest Bedroom. I having been using your service for years and have always had a pleasant experience. 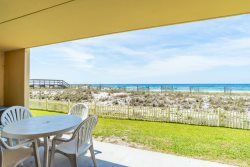 We have stayed in Beach Colony for several vacations and have always enjoyed the property. I believe the Case group has used Perdido Realty for the last 8-10 years and have been very happy with our relationship with you. This year was no exception. The limit on parking passes was only negative part of our most recent stay although I know this issue was on Beach Colony and not PR. Excellent staff!! We have used then five or more times and they are really good. Busy during peak season, so be patient because they work really hard and efficient. Our unit this time needs some up dates. Mattresses are old and squeaky, master shower door is hard to open and close and balcony floods and does not drain well. The TV's were great. We enjoyed watching the Olympics. Kitchen was well equipped and plenty of room to eat in unit or on porch. Patio furniture was the best we have had.